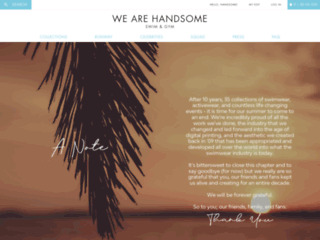 We Are Handsome’s latest swim collection - WILDCARD - reminds us of the decade that refuses to be contained. With its latest styles and prints, the collection is intended for those with an appetite for adventure. Bold, vibrant and daring graphics play together to create an invigorating collection of ready-to-wear and swim in fearless patterns: The Lark, Babylon, The Mirage and Equilibrium. The essence of the 90’s is exemplified in the bright and funky shapes of the Equilibrium, while a striking display of bright palm leaves and geometric edges make up the Babylon. The Mirage features a White Tiger iconic to the brand, juxtaposed with an array of deep blues, pops of red and peach florals. The Lark is a mix of vivid-colored geometric shapes and tropical birds reminiscent of the unpredictable qualities of the decade. From the Cross Plunge One Piece and the Long Sleeve Play Suit, to the Zip Top and High Cut Pant, Wildcard will take you back to an era that was a catalyst for us all.